Jo is a Senior Researcher at NZCER. She has a keen interest and expertise in policy and programme evaluation across diverse contexts. In recent years much of her work has been in the area of initial teacher education and early career teaching. A common thread is how people (particularly teachers) are prepared for and supported to do their work through initial and ongoing training, mentoring, and communities of practice. Jo was a lead evaluator on the four-year evaluation of the Teach First NZ pilot and has recently completed a Postgraduate Diploma in Social Sector Evaluation (Distinction). Jo has expertise in evaluation methodologies. She enjoys working with clients to meet their evaluation needs, and using mixed-methods to answer evaluation and research questions. 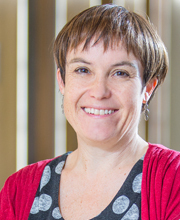 Jo's research interests are wide-ranging, and at NZCER she has worked on projects in the areas of school leadership, early career teachers, NCEA, special education, prison education, and student health and wellbeing. In addition to her role as a senior researcher and evaluator, Jo leads NZCER's coordination of the Teaching and Learning Research Initiative (TLRI), a contestable research fund that NZCER manages for the Ministry of Education. Jo has over 20 years’ experience in education and educational research, including a decade working in research and evaluation in the government sector in New Zealand and Scotland. In the government setting she has managed portfolios of research and evaluation projects in curriculum implementation, middle schooling, Pasifika education, special education, and early childhood education. Jo has a Postgraduate Diploma in Social Sector Evaluation (Distinction), MA in Education (first class), BA in Sociology, and a Diploma of Teaching (Primary).